Pixie at 5 has picked up her CA CH a RBIS & 2 group 4 & is in top 10 CA dogs in 2018. 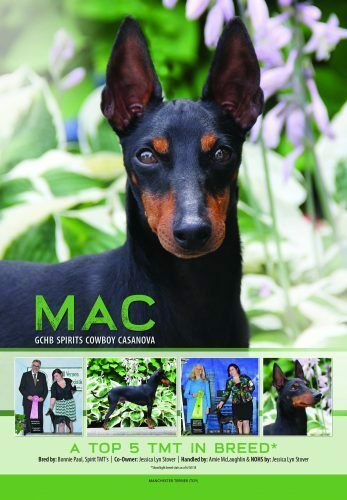 Mac has had a good yr, picking up his bronze and silver GCH, a 2nd NOH RBIS and MGP Been in the top 5 all Year. Spiceisle Sweet baby blue & Saint Lazars who’s your daddy have moved on, thier offspring will be gracing the ring in 2014! Spirit’s April Rain. We are very excited about this. She did very well at her first show in Canada. We have a new litter out of Echo and Toby (CH ST LAZ Who’s Your Daddy) and we are watching a few (9wk) puppies to see how they will do. Thanks to Betty Hodges and Dianna Texter we have added a new Boy, Rosewood Ready Aim Fire aka Colt he will be out in 2014. and Spirit’s It’s Harvest time aka Autumn will be back out to finish her championship title. So see you out there. For the past 7 years we have loved, shown and bred Toy Manchester Terriers. Our manny’s are raised around small kids, and love them. They are trained to ride in cars, which most learn to love. The Manchester Terrier comes in two varieties – The Toy, weighing up to 12 pounds and the Standard, weighing over 12 pounds and up 22 pounds. A over sized toy can move up in the show ring, and be shown as a standard. The Manchester Terrier is very observant and makes an excellent family pet and are a real joy to live with. This sleek, yet sturdy breed with its smooth, compact body, black glossy coat and distinctive rich mahogany markings, presents an elegant appearance. Terriers take a special kind of people and are not for everyone. How do I know if I am a terrier person? You understand what terriers are bred to do, understand that they are free thinkers and take their jobs very seriously. Than you too, could be a terrier person. They train well, but sometimes they take a pause to think things through. 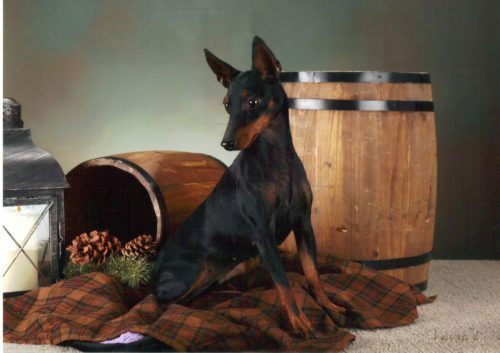 If you are considering a Toy Manchester Terrier for show or for a family pet, you have come to the right place. As they are a real joy to live with. The Manchester Terrier is very observant and makes an excellent family pet. The breed does well in most any thing they learn, obedience, rally CDC, agility, fly ball, earth-dog, even lure coursing. For a little dog they are hardy and they like to hike, jog, etc. Please feel free to take a look at our site and our manchesters. You can contact us anytime have any questions. Check out our puppy page for our upcoming litter or young adults.